Billy Holland: just when I thought I was out, they ... pushed me further out. The Mole was watching the Munster vs Treviso game at Thomond Park on the idiot-box a couple of weeks ago, and was struck by one selection call in particular. Niall Ronan hobbled off just before halftime, and he was replaced by … Donncha O’Callaghan. Billy Holland was left sitting on the bench. Your openside goes off in the first half, and you replace him not with the replacement flanker you’ve named in your matchday squad, but with a front-jumping second row? In those circumstances, the reality of the situation facing Holland couldn’t be avoided: instead of the injuries to his backrow team-mates providing him with the chance to really go out and make a name for himself, to prove his worth to the squad, they were instead showing the management’s true assessment of his value. Tough break, kid. The same thing happened the next week in Munster’s home fixture against Castres in Round 5 of the Heineken Cup. Again, Niall Ronan was forced to pull out of the game in the first half – this time with what has since been confirmed with a serious knee injury – and again Munster went for the O’Callaghan card. It’s difficult not to see it as a show of contempt for Billy Holland’s abilities from his own coaches. Holland was sitting on the bench as a replacement blindside: you’d think that if the openside goes off, they just switch O’Mahony around and bring in Holland on the blindside. Nah. Instead, they put one of their starting second rows to blindside, brought on another second row, and switched their blindside to openside. As bad as that was, a final indignity has been inflicted on Holland with the selection for the final match of the group stages against Northampton. With Ronan ruled out for the remainder of the season, Donncha O’Callaghan starts at No4 and Donnacha Ryan starts at No6. Mick O’Driscoll is called into the squad as the replacement second row, and Billy Holland loses his place on the bench to 22-year old academy player Dave O’Callaghan [often known as DOC 2.0, for obvious reasons]. O’Callaghan has only started one game for Munster, and is essentially a younger version of Billy Holland – a guy who was a second-row at schools and underage level, but has been switched to the blindside because he lacks a little bit of height and strength for the engine room at an elite level. He doesn’t cover openside or No8, so it’s a straight like-for-like replacement, with the coaches showing more faith in the academy nipper than in a guy who is in his fifth season for the province. It must be a smack in the mouth for Holland, who was part of two great performances for Munster against touring international teams – the All Blacks in 2008 and Australia in 2010. He’s a durable, versatile and intelligent player who unfortunately falls between two stools: too small to be a first-class second-row, and too slow to be a first-class blindside. Despite his close ties to the province [his old man Jerry is a former Munster player and manager], Holland should really cut his ties with Munster and move on. He’s not going anywhere in his career with the province, and maybe it’s the death of a dream. However, he is absolutely capable of making a life for himself in pro rugby: he’s not there just because he’s the ex-manager’s kid, he’s a good player in his own right and needs to go somewhere that he can play games and fulfill his potential. Now, Billy Holland may not be the name that Connacht fans dream of, but a guy like that would be a great addition to their squad. He’s capable of playing a couple of positions, has relatively few miles on the clock for a 26 year old and must have a serious chip on his shoulder about the lack of gametime he’s received over the last three years. He would be much better off in Connacht than in Munster, even though Connacht are strong at No6. Holland is a player with savvy and grit – and considerable pedigree, he’s got Ireland Schools, Ireland U19s and Ireland U21s caps – who could do well in either the Premiership or in France, so it’s not as though he has no options open to him. However, he should read the writing on the wall and realize that it’s not going to happen for him at home. 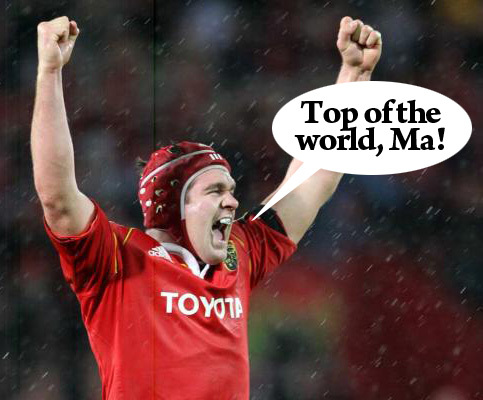 This entry was posted in Opinion and tagged Billy Holland, Generation Ligind, Munster by dementedmole. Bookmark the permalink. Not sure Connacht would be a great move for Holland. We already have Muldoon at 6, with Andrew Browne (who had a great season last season subbing for Muldoon) due back soon from injury. Not to mention another Munsterman who was surplus to requirements in Eoghan Grace who can’t buy 5 minutes off the bench. David Gannon, Mick Kearney and Mike McCarthy have all lined out at 6 this season, and all are second rows. Connacht like a pack with the second/back row hybrid at six just as much as Munster do. Agree with that umm but I don’t think it would hurt to take him on, after all Swifty is nearing the end (unfortunately!) and so with Kearney, Gannon and Browne all looking to move into the second row that would open up a spot potentially. Also when you consider that TJ Anderson hasn’t looked up to it at 6 this season it could be worth a look. Obviously it would be an incredible situation if Holland came west and couldn’t get a look in, and this could be a reason for him moving to foreign shores, but aren’t we always complaining that we lack real depth when injury struck. I guess this is always the crux of Connacht’s recruitment problem, if the player sees it as a career snub to come to Connacht then we’re battling against the tide. On a slightly different note, what a win last night! A tighthead and some decent halves and we can be a great team! He could join the Gringos, at riding the pine behind the two best in the world is nothing to be ashamed of.